The Larry H. Miller Group of Companies was founded with a single Toyota dealership Larry and his wife, Gail, bought in 1979. Today, the group consists of 80 companies with about 10,000 employees, generating revenues of more than $5 billion. The family enterprise encompasses a fleet of dealerships, a car financing firm, movieplexes and a number of sports businesses, including an NBA team and the arena in which it plays. Five years after her entrepreneur husband died in 2000, Michele Rollins decided her children needed to be brought in on the family’s financial arrangements. The late John W. Rollins Sr. had built an empire of companies involved in trucking, environmental services and pest control. He also owned racetracks and hospitality complexes. “The kids needed to know more,” explains Rollins, the chairman of Rollins Jamaica Ltd., the holding company for the island nation’s Rose Hall Developments Ltd. Many of us are aware that more than half of U.S. GDP comes from family-controlled businesses. Yeah, we family business owners are kind of a big deal. We also provide millions of jobs, help give meaning to our family members’ lives, pride ourselves on strong cultures and impact our communities. These things we have in common. NextGens who join their family business often make a number of changes to modernize the company, such as upgrading the technology and increasing the company’s presence on social media. It’s only natural for the younger generation to make these kinds of innovations; they are generally the family members who are most up to date in these areas. Some NextGens go a step further: They start a new, related company that will appeal to a younger crowd or another new market segment. One such entrepreneur is 32-year-old Alyza Bohbot. Imagine your daughter coming home from fourth grade one day and, with a defeated look, handing you her midterm report card. She showed such promise in kindergarten. But for the second quarter in a row, she’s received Cs, B-minuses, and even some Ds and Fs. It’s been a mostly good decade with this kid, but enough is enough. You decide it’s time to disown her. You tell her she needs to find some other family to live with. The late Larry H. Miller, founder of the Larry H. Miller Group of Companies, was not a good student. Though he was intelligent, he was often thrown out of class and school. He barely graduated high school. When Gail and Larry Miller bought into the NBA’s Utah Jazz, they had been to just a few games, and that was only by invitation from people who hoped the couple would invest in the team. The Jazz moved from New Orleans to Utah in 1979, the same year the Millers bought their first car dealership, launching the business that is now a family of 80 companies. During the 2009 recession, an article in the New York Times highlighted one of the great glories of the family business: its resilience. The author explored how family businesses may have unique potential to survive — even prosper — during hard times such as the recession thanks to several factors, including the fortifying power of shared history and accumulated knowledge. Of the reasons noted in the article, the most frequently mentioned was the strength of the family as a resource, their shared family ethic pulling together to carry the business forward. These days, growth is at the top of every business leader’s to-do list. 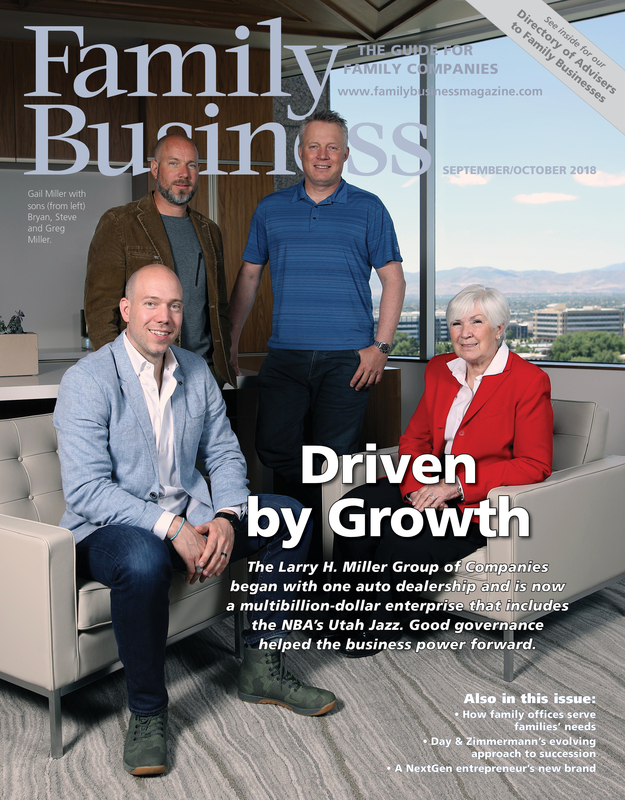 For family business owners, growth carries an even higher priority because of families’ focus on future generations and the legacy they leave behind. In recent decades, acquisitions have been a popular driver of family companies’ strategy. As competition for targets across markets has tightened and prices have increased, however, expanding by acquisition alone has become less viable as a strategy.